ORLANDO, Fla. / WASHINGTON Jan. 15, 2019 – GrayRobinson, P.A. announced it has acquired Washington, D.C. based lobbying firm Eris Group, LLC, effective February 1. The acquisition extends GrayRobinson’s capabilities beyond Florida, and expands its capacity to serve clients with federal lobbying needs. With this acquisition, GrayRobinson’s Government Affairs and Lobbying Practice Group grows to 26 lobbyists throughout Florida and Washington. GrayRobinson is a full-service law and lobbying firm with attorneys and government relations professionals throughout 15 offices. Our attorneys, consultants. and regulatory professionals provide legal and government relations services to Fortune 500 companies, emerging businesses, lending institutions, local and state governments, developers, entrepreneurs, and individuals. We have created a firm that serves our clients and our communities while counting creativity as a hallmark characteristic and insisting on ingenuity and innovation. Our mission is to apply our legal, lobbying, and regulatory backgrounds and skills in ways that enable our clients to define and achieve their goals, while supporting our communities as a matter of mission as well as passion. 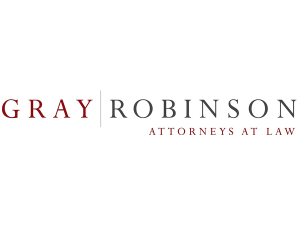 For more information, please visit www.gray-robinson.com. Eris Group is a government relations advocacy firm dedicated to developing integrated legislative, regulatory, communication, and political strategies to meet their clients’ objectives. Headquartered on Capitol Hill, the firm strives to build long-term relationships through direct and frequent contact with policymakers to help its clients thrive in the current political environment.